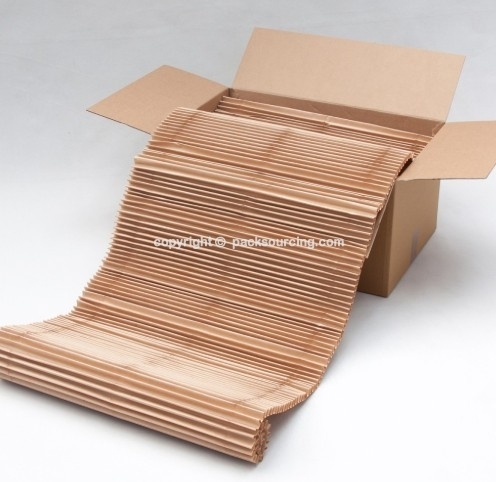 It comes in its own convenient 60 x 40 x 30cm box containing 10 meters of 60 cm wide material with tear-off cuts every 40 cm. cushionPaper is made from 100% recycled paper and is itself completely recyclable and ecological. cushionPaper is so effective that you can use it to substitute bubble wrap, styrofoam (polystyrene) and other plastic products that can harm the environment. cushionPaper provides excellent shock-absorption and protection and is made from recycled material that is 100% recyclable. cushionPaper is versatile; it is so flexible that it can be wrapped around products of any shape or size providing an ample thickness of protection around fragile items. cushionPaper is the sure-fire solution; thanks to the regularity and height of its waves, you can fill the voids in any box providing a homogeneous, high performance protection against the vibrations, bumps and shocks of shipping. The material is half-cut every 39 cm so that you can tear off the amount you need without having to use scissors or cutter.